This 'apartment' is really an independent house (dates from the 17th century), with separate entrance. Its exterior and interior were recently restored, with care taken to conserve its original characteristics. The home is sited in a corner of Campo San Barnaba, one of the most suggestive and picturesque place of Venice, in the artist quarter, near Accademia. Our apartment is really one minute from the vaporetto stop of Cà Rezzonico (sited in the 'centre' of Canal Grande in front of Palazzo Grassi, near the Accademia bridge), from which you can reach both Rialto and San Marco in around five minutes. The quarter offers cultural activities and characteristic spots that also stay open late in the evening. At the same time, it is a tranquil and relaxing place, without the usual bustle of tourists. The house, very nice as I told above, and well lighted, consists of two floors. The first floor includes the entrance, the kitchen/dining area and a bathroom with shower. 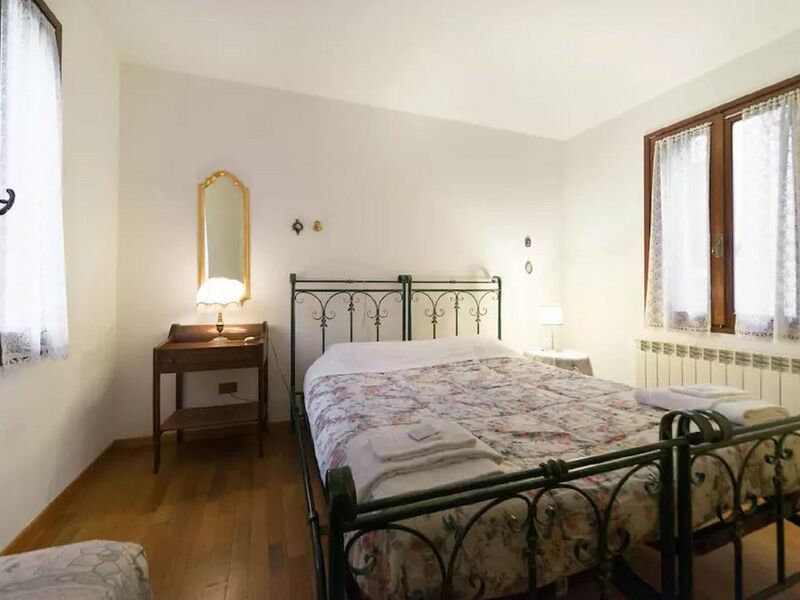 The second floor offers a living room with a comfortable double bed sofa and television with a satellite connection and a master sleeping room (with one double bed and one single small for child, so there are five bed places). The house has an independent heating system for winter and an air conditioning system for summer. The kitchen is well equipped with new appliance: gas stove, a large refrigerator, a microwave oven and grill, dishwasher, and washing machine. In the living room and in the bedroom there are two large closet, a work desk. The house has it's own telephone and an ADSL (high speed) internet line with a Wi-fi router. Quiet and relaxing place few walking minutes far from all the most interest places of the city. You can setup your preferred temperature. ADSL WIFI fast and secure internet Unlimited. Dishwasher, washing machine, stove, american coffe maker, italian coffe maker, toaster. Rick Steves Venice guides, various guides and maps, some books in english. This is a charming little rental house in a great location. Very quiet. Highly recommended!! Antonio was so nice to deal with. He cleans the unit himself and does a great job. I’m very fussy but it was spotless. The apt itself is what I would describe as shabby chic decor. Very charming. Terrific restaurants around the corner so u need not wander far for a good meal. Only cons I can think of are no trash receptacles upstairs nor any tissues anywhere. Also having the bathroom downstairs was a bit of a pain but for only a few days stay it was fine. Antonio is an outstanding host! He met us at the water bus and took us to his charming little house. Perfect for 2 friends. We loved the location, just off of a delightful square and a 2 minute walk to the water bus. Venice is magical and we already want to return to the City and this lovely home. The place is nice, clean and in great location. This was a great place to stay for our family. It is a great location with the necessities close by. The owner was very easy to work with and very adaptive to our arrival and departure schedule. Thanks so much-we had a great stay!!! Antonio was a nice host - he met us at the apartment and walked us through how to use it. He also has a manual on how to use electronic items in the home. For the rest of the stay, he was accessible but it often took up to several hours for him to get back to us. The apartment was VERY clean and has many nice touches and details. Antonio has also fully stocked it with many thoughtful items such as umbrellas for when it rains. The master bedroom is two twin beds joined so my husband and I converted the sofa bed and used that - it was very comfortable. The main reason we would give it a 4 instead of 5 is that size of the apartment is significantly smaller than what the photos suggest. The bathroom and kitchen were very small, in particular. That being said, I believe it may be an average size for Venice...just not what we had anticipated from the pictures. Also, it was great to have access to a washing machine - Antonio also had detergent, clothes pins and a rack so we were able to comfortably do laundry. A word of warning to Americans - the machines there are different! It took us a while to figure it out but it worked fine once we did. The location is close to many restaurants, very close to the Ca' Rezzonico water bus station but is also quiet at night. The apartment is not along the water but not far from a canal. It was approximately a 15-20 minute walk from the train station to the apartment or a 25 minute ride on the water bus. Rates are ALL INCLUSIVE : cleaning, linens, towels, gas, electricity, water, air conditioning, heating, internet wi-fi high speed, satellite television. LONG STAY always discounted (more than 7 nights).